Last week, I sadly flipped through photos taken by our chapter in Dallas at the scene of a large apartment fire that they responded to. 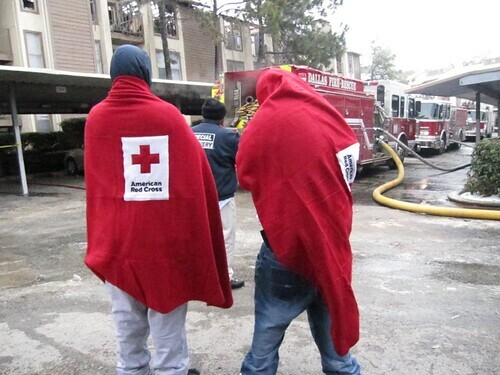 Many Red Cross blankets were given out to the residents, who seemed cold and anxious waiting outside by the fire trucks. Unfortunately, the Red Cross has to respond to dozens of fires a week – regardless of the time of year or the weather outside. The last thing I would want is to be stuck outside in the cold, wondering what I should do to find shelter after a house fire. Ironically, this past weekend I moved in to a new apartment and had a fire emergency – which thankfully ended with just some damage to the kitchen floor. I was lucky, but many people aren’t. Keep yourself safe by reviewing our Fire Safety tips – in fact, read them twice! Many fires are preventable, and being careful is your best defense against a devastating home fire.